We just finished a three day trip on the Deschutes from Trout Creek to Maupin yesterday. 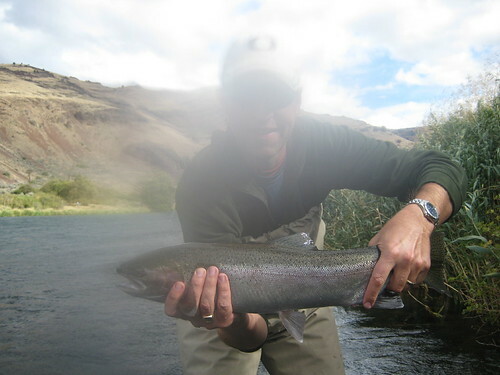 Although it is no secret that the lower Deschutes (below Maupin) has had good numbers of steelhead in it for some time, there are now good numbers of fish throughout the system. Aside from some wind, we had good weather throughout the trip and enjoyed some cloudy weather. This helped things out; steelhead will generally come for a swung fly better when they don’t have the sun shining directly in their eyes. We did well swinging flies, but also did some nymphing when the sun came out. A variety of wet flies caught fish. In my boat, we did well on a sparkly purple fly, the Silver Hilton, and the Lady Carolyn (all #4). When the sun comes out, try fishing a black or purple leech on a sink tip. Top producing nymphs were the Prince Nymph (#8-#14), a black girdle bug (#6-#8), as well as a Flash Back Pheasant tail (#12-#14). Trout fishing also remains good. We caught some nice trout on the surface with October Caddis imitations as well as small caddises. We also took some nice trout on nymphs. 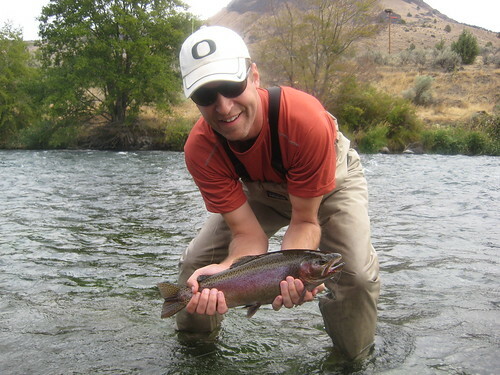 Mid and Late September are a nice time of year on the Trout Creek to Maupin stretch. 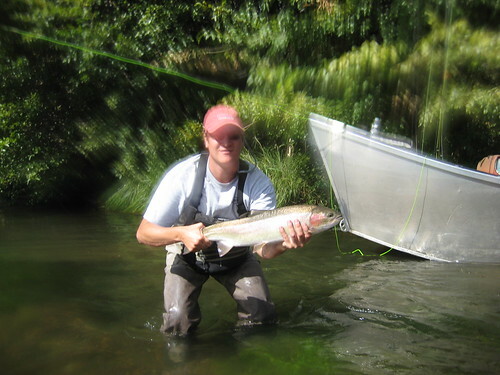 The trout fishing is generally good, there are usually fishable numbers of steelhead and light traffic. This was a weekend trip and we saw very few people. As we move into October, there will generally be more steelhead up on this stretch but also more people trying to catch them. Because the weather cools and the days get shorter, November is not a very busy month on this stretch of the river, but can offer some spectacular steelhead fishing. That time of year, the fish are in and are unharassed. This makes the fish happier, and when they are in a good mood, they tend to bite better. For anyone interested in doing a guided trip on the Deschutes, we have some availability still in October and more openings in November. With record numbers of steelhead coming up the river, this is the year to do it.